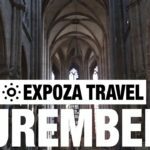 Vacation travel video about destination Nuremberg in Germany. Nuremberg, the ‘secret capital’ of German Franconia.and ‘treasure trove of the German Reich’. The epitome of German romanticism and tradition with a long history, but also bitter memories of quite recent times. Of the original one hundred and thirty towers of the city wall, only seventy one have survived. The city fortifications from the fourteenth and fifteenth centuries emerged after the union of the previous two halves of the city. The twin-towered St. Lorenz Church is the largest and artistically most important religious building in the city and dates back to 1260. The interior is of Gothic splendour and the nave extends at the altar to a light-filled, three-aisled hall with huge columns and an almost playful, overlapping vault in the centre. The mediaeval Nuremberg Castle towers over the city from a sandstone rock, a fortress system whose construction began under Emperor Henry The Third. The importance of Nuremberg can be highlighted by the fact that each ruler of Germany resided in the castle until 1571. Tranquillity fills the air around Dozen Pond in the south of the city. In 1933 it was the Nazi Party Rally Complex of the German National Socialist Party and on 20th November, 1945, in the west wing of the old Justice Palace, the Nuremberg Trials took place against numerous infamous war criminals. A memorial was established there in which the various legal processes were documented in both words and pictures, and supported by audio recordings. Nuremberg has somehow managed to survive and is now a city of tradition and modernity, its daily charm stemming from its old and re-created cultures, and its positive outlook and embrace of contemporary times.